Author contributions: Undela K designed the study, done literature search, data analysis, manuscript preparation and manuscript editing; Shah CS done literature search, data extraction and manuscript review; Mothe RK done data extraction and manuscript review. Conflict-of-interest statement: Authors declare that they have no conflict of interest. To conduct an overview of meta-analyses to critically appraise the evidence and present a comprehensive evaluation of the association between statin use and risk of site specific cancers. MEDLINE, EMBASE, the Cochrane Database of Systematic Reviews and Web of Science databases were searched from inception until 31st May 2016. The electronic database search was supplemented by a hand search in PROSPERO and relevant journals which are not indexed in above databases. Meta-analyses that examined the association between statin use and risk of site specific cancers were included. Two reviewers independently screened the literature, abstracted data, and assessed study quality using the Assessment of Multiple Systematic Reviews (AMSTAR) tool. Overall, 38 meta-analyses covered 13 site specific cancers were included. More than half (68%) of the meta-analyses were moderate in quality with an AMSTAR score 4-7 out of a possible 11. Based on current evidence from meta-analyses, use of statin decreases the risk of certain cancers, such as colorectal (8%-12%), gastric (27%-44%), hematological (19%), liver (37%-42%), oesophageal (14%-28%), ovarian (21%) and prostate cancer (7%). On the other side, evidence from meta-analyses also suggests that there is no association between statin use and risk of bladder, breast, endometrial, kidney, lung, pancreatic and skin cancers. This overview of meta-analyses with variable quality has been shown that the statins may have a potential role in cancer chemoprevention and reduce the risk of some site specific cancers, but not all. Core tip: Statins are one of the most commonly prescribed pharmaceutical agents worldwide and atorvastatin remained the largest source of spending in the class. In recent years, emerging experimental evidence suggests that statins may have a potential role in cancer chemoprevention. However, a large number of randomized controlled trials and observational studies published to examine the association between statin use and risk of site specific cancers were given conflicting results. This overview of meta-analyses with variable quality has been shown that the statins may have a potential role in cancer chemoprevention and reduce the risk of colorectal (8%-12%), gastric (27%-44%), hematological (19%), liver (37%-42%), oesophageal (14%-28%), ovarian (21%) and prostate cancer (7%). Statins (HMG-CoA reductase inhibitors) are a class of drugs that reduce serum cholesterol levels by inhibiting HMG-CoA reductase, a rate-limiting enzyme in the mevalonate synthesis pathway. They are commonly used in the management and prevention of cardiovascular diseases. Statins are one of the most commonly prescribed pharmaceutical agents worldwide and atorvastatin remained the largest source of spending in the class. With the effect of recommendations for primary prevention with statins by the recent American College of Cardiology/American Heart Association guidelines on the assessment of cardiovascular risk and on the treatment of blood cholesterol, more than a Billion people are expected take statins. Cancers are among the foremost causes of morbidity and mortality worldwide. There were approximately 14 million new cancer cases and 8.2 million cancer related deaths in 2012. Over the next 2 decades, the number of new cancer cases are expected to rise by about 70%. Apart from reduction in cholesterol level and cardiovascular mortality due to substantially increased use of statins during past three decades, there is a long-lasting debate on the potential association between statin use and the risk of cancer. In recent years, emerging experimental evidence suggests that statins may have a potential role in cancer chemoprevention[6-8]. It has been proven that statins activates several mechanisms to cancer cell death. Statins induce cell apoptosis by influencing the expression/activity of proteins involved in cell cycle such as cyclins, cyclin-dependent kinases (CDK), and/or inhibitors of CDK. Statins may inhibit cell cycle progression by both extrinsic and intrinsic pathways. By inhibiting isoprenoid synthesis, statins may lead to changes in molecular pathways dependent on the epidermal growth factor receptor. Also, statins may weakens the cell membrane by inhibiting cholesterol synthesis. A large number of randomized controlled trials (RCTs) and observational studies published to examine the association between statin use and risk of site specific cancers were given conflicting results. Many researchers conducted meta-analyses to provide more reliable findings on this association. In spite of the fact that the meta-analysis show up at the highest level of the evidence in the evidence based practice, comparative data across different domains are often lacking. Overviews are a relatively new approach to generate evidence from several systematic reviews/meta-analyses and become popular in generating the evidence in health care. Therefore, the objective of this overview is to summarize and critically appraise the evidence of relevant meta-analyses to evaluate the association between statin use and risk of site specific cancers. A protocol for our overview of meta-analyses were drafted using the Cochrane Handbook for overviews of reviews. The drafted protocol was circulated to subject experts and methodologists for feedback purpose. Based on the feedback, the protocol was revised and final version published in PROSPERO International prospective register of systematic reviews (Registration Number: CRD42014013160) (Supplementary Table). A comprehensive literature search was performed in MEDLINE, EMBASE, the Cochrane Database of Systematic Reviews and Web of Science from inception to 31st May 2016 to identify the relevant studies. The search strategy included both medical subject headings (MeSH) and free text terms related to statin and cancer. “Hydroxymethylglutaryl-CoA Reductase Inhibitors and Neoplasms” were the MeSH terms used for statin and cancer, respectively. “Statin(s) or HMG-CoA reductase inhibitor(s) or lipid-lowering agent(s) or atorvastatin or pravastatin or fluvastatin or lovastatin or cerivastatin or mevastatin or rivastatin or rosuvastatin or simvastatin and cancer(s) or neoplasm(s) or malignancy(ies)” were the free text terms used for search strategy. Search strategies were limited to systematic reviews and meta-analyses focused on human participants. In addition, specific journals and cross references of relevant studies were searched manually to capture relevant systematic reviews/meta-analyses and also PROSPERO database was searched to identify completed, unpublished systematic reviews/meta-analyses. Two authors (KU and CSS) were independently involved in title/abstract based and full text based screening to capture all relevant articles using a predefined inclusion and exclusion criteria. Disagreements were resolved by discussion and a third author (RKM) was approached whenever required. We included meta-analyses (didn’t find any systematic reviews without meta-analysis) that focused on risk of getting site specific cancers among statin users. Meta-analyses conducted by using RCTs and/or observational studies and published at any point in time were included. 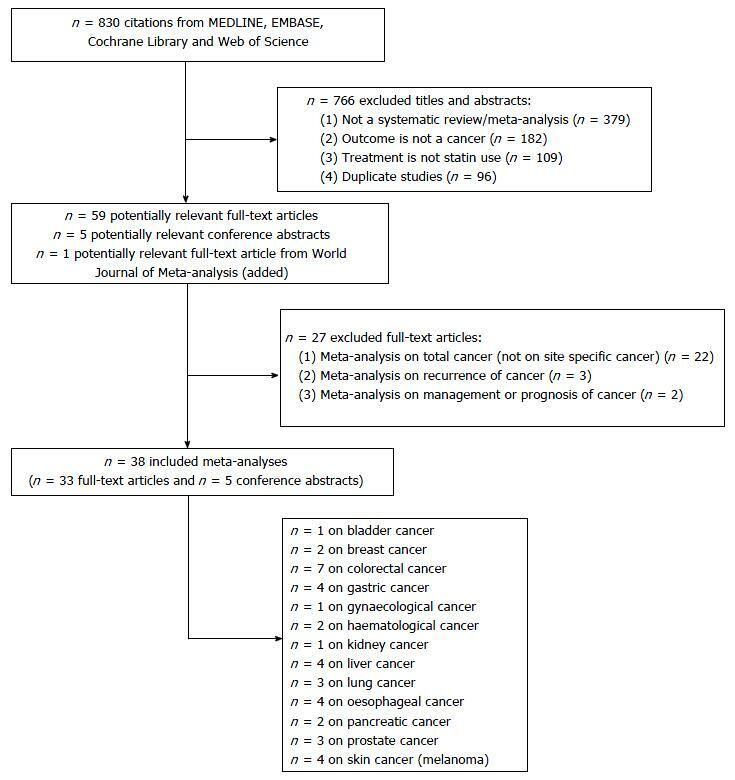 Meta-analyses focused on total cancer (i.e., the aggregate of all malignancies) were excluded as all original studies included in these meta-analyses were also included in meta-analyses on site specific cancers with some additional studies. Meta-analyses conducted to identify the effect of statin use on management or prognosis of cancer and also at risk of recurrence of cancer were excluded. To abstract the relevant data from each included study, specific data abstraction form was drafted, pilot-tested by all authors independently on a random sample of five articles and same were revised after this exercise, as necessary. After finalizing the data abstraction form, two authors (KU and CSS) have analysed all articles independently to capture relevant data. Discrepancies were resolved by discussion and third author (RKM) was approached whenever required. The following information was captured from each study: (1) first author’s last name, year of publication, and country where the study conducted; (2) search methods followed, number of studies identified, type of study designs included, and criteria for study selection and data extraction; (3) methods followed to check the quality of individual studies and to identify the heterogeneity and publication bias; (4) number of subjects and cancer cases involved, outcomes of quality, heterogeneity and publication bias tests, and pooled RR estimates with 95%CIs for primary outcome, secondary outcome and subgroup analyses; and (5) conclusions and if any limitations of the study. Risk of bias assessment of included studies was performed by using the Assessment of Multiple Systematic Reviews (AMSTAR) tool. AMSTAR is highly reliable and validated tool assesses the degree to which review methods avoided bias by evaluating the methods against 11 distinct criteria. Quality rating was as follows: A score of 8-11 is high quality; 4-7 is moderate quality and 3 or lower is low quality. Each included meta-analysis was appraised for quality by two authors independently (KU and RKM) and conflicts were resolved by discussion or the involvement of a third author (CSS). The present work was performed as per Preferred Reporting Items for Systematic Reviews and Meta-Analyses (Checklist S1). The literature search resulted in 830 titles and abstracts, of which 766 were excluded for not fulfilling the eligibility criteria. Of the 59 full-text articles retrieved and screened in duplicate, 27 were excluded for reasons depicted in Figure 1. Resulted 32 full-text meta-analyses[15-46] in addition to five relevant conference abstracts[47-51] and one relevant full-text published in World Journal of Meta-analysis were included in this overview. We didn’t find any completed, unpublished systematic reviews/meta-analyses on this topic in PROSPERO. A total of 38 included meta-analyses covered 13 site specific cancers as an outcome for statin use. Majorly seven meta-analyses published on colorectal cancer[18-20,47-50], followed by gastric (4)[21-24], liver (4)[29-31,52], esophageal (4)[35-37,51], skin (4)[43-46], lung (3)[32-34], prostate (3)[40-42], breast (2)[16,17], hematological (2)[26,27], pancreatic cancers (2)[38,39] and each on bladder, gynecological and kidney cancers. The characteristics of the included meta-analyses are presented in Table 1. Table 1 Characteristics of the included meta-analyses. gConducted among elderly people. APC: Advanced prostate cancer; BE: Barrett’s oesophagus; CBML: China BioMedical Literature; CC: Case-control; CNKI: Chinese National Knowledge Infrastructure; CRCT: Central Register of Controlled Trials; CSJFD: Chinese Scientific Journal Full-text Database; GI: Gastro-intestinal; HCDS: Higher cumulative dosage of statin; I2: I2 test value; IPD: Individual patient data; ISI WK: Institute for Scientific Information Web of knowledge (Former term for Web of science); LSU: Long-term statin use; n: Number of studies; NA: Not available; NMSC: Non-melanoma skin cancer; Oss: Observational studies; q: Cochran Q test P value; RCTs: Randomized controlled trials; RR: Relative risk; SCI: Science citation index; UGIC: Upper gastrointestinal cancer; WS: Web of science; ↔: Non-significant association; ↓: Statistically significantly decreased risk; ↑: Statistically significantly increased risk. All included meta-analyses published between 2005 and 2014; majority [25 (66%)] were published in and after 2012. The first authors of the meta-analyses predominantly based in China (15 studies) followed by Greece (7), United States (7), Canada (2), India (2), United Kingdom (2), and each in Australia, Italy and Japan. Except two studies[42,49] where the information on databases searched not available, remaining 36 (95%) studies searched MEDLINE for relevant studies, followed by EMBASE [22 studies (58%)], Web of Science/Web of Knowledge/Science Citation Index [20 studies (53%)] and Cochrane Library [15 studies (39%)]. Out of 38 included studies, 22 (58%) were included both RCTs and observational studies, nine (24%) studies included only RCTs and five (13%) studies included only observational studies, and information not available for remaining two studies[42,51]. For the assessment of heterogeneity, 34 studies used both Cochrane Q test and I2 test, and information not available for remaining four studies[28,47-49]. Majority [34 (89%)] of the studies assessed publication bias either by using Begg and Mazumdar adjusted rank correlation test and the Egger regression asymmetry test or funnel plot. Two studies[35,36] not assessed publication bias and information not available for remaining two studies[21,29]. More than half [26 (68%)] of the meta-analyses were deemed moderate quality with an AMSTAR score 4-7 out of a possible 11. Only six (16%) studies were found to be high quality with score ≥ 8, among these one study was a Cochrane systematic review with the highest quality score 10. One study found to be low quality with the score 0 and five studies[47-51] were not having sufficient information to calculate AMSTAR quality score. Majority of meta-analyses were degraded due to lack of “a priori” design, not searched for gray literature, not provided a list of excluded studies from screening of potentially relevant full-text articles and not used any scale to assess the scientific quality of the included studies in formulating conclusions. The pooled relative risk with 95%CI of the primary outcome of all included studies is shown in forest plot (Figure 2) and it is depicted with sub-group analysis based on cancer type. Figure 2 Forest plot of pooled relative risk with 95%CI of primary outcome from all included studies. Statin use and risk of bladder cancer: Only one meta-analysis was conducted to identify the risk of bladder cancer among statin users. There was no association found between statin use and risk of bladder cancer and the result was same even after subgroup analysis of study design and for long-term statin use. Statin use and risk of breast cancer: A meta-analysis published by Bonovas et al in 2005 to estimate the association between use of statin and risk of breast cancer by including seven RCTs and nine observational studies. There was no association found between statin use and risk of breast cancer with no heterogeneity among studies. The association becomes same even after subgroup analysis of study design. In 2012, Undela et al updated this meta-analysis by including 15 more observational studies published after previous meta-analysis. This study also gives an almost similar conclusion, though there was a heterogeneity identified among studies. Additionally, this updated meta-analysis found 47% reduced risk of recurrence of breast cancer among statin users, but no association between long-term statin use and risk of breast cancer. Statin use and risk of colorectal cancer: Seven meta-analyses (3 full-text[18-20] and 4 conference abstracts[47-50]) published on this association between 2007 and 2014. Almost all the studies included both RCTs and observational studies published between 1995 and 2013 and identified heterogeneity among studies. Except the study by Bardou et al (which included only RCTs), remaining all the studies found 8%-12% reduced risk of colorectal cancer among statin users. However, a modest reduction in risk or an effect may be associated with higher doses of statins. Based on the subgroup analyses by two meta-analyses[19,20] published in 2014 (which are full-text and included a maximum number of observational studies), risk reduction was 7%-9% among cohort studies and 8%-16% among case-control studies. Studies included RCTs reported no association between use of statin and risk of colorectal cancer alone for RCTs. One study found there was a 19% reduction in the risk of rectal cancer among statin users. Another study found no association between long-term statin use and risk of colorectal cancer. Statin use and risk of gastric cancer: Four meta-analyses[21-24] published between 2011 and 2014 to identify the risk of gastric cancer among statin users. Except the study conducted by Shimoyama et al (published in 2011, searched only PubMed Central and included only RCTs), remaining all studies suggested that the statin use reduces the risk of gastric cancer by 27%-44%, though they identified the heterogeneity among studies. In subgroup analysis, observational studies were found to identify this reduced risk, but not RCTs. Statin use and risk of gynecological cancer: A meta-analysis published recently to identify the association between statin use and risk of gynecological cancer. The study included both RCTs and observational studies published between 2000 and 2013 on this association. It didn’t find any association between statin use and risk of gynecological cancer. On subgroup analysis, the association remains same for RCTs and cohort studies, but case-control studies alone show 39% decreased risk of gynecological cancer among statin users. On secondary analysis using available studies, there was no association found between statin use and risk of endometrial cancer, but decreased (21%) risk of ovarian cancer. Statin use and risk of hematological cancer: A meta-analysis published by Bonovas et al in 2007 to estimate the association between statin use and risk of hematological cancer by including six RCTs and eight observational studies. No association identified between statin use and risk of hematological cancer. The association found to be same even after subgroup analysis of study design. In 2014, Yi et al updated this meta-analysis by including six more observational studies published after Bonovas et al meta-analysis and gave contrast results by finding 19% decreased risk of hematological cancer among statin users. On subgroup analysis, this association remains same for observational studies, but not for RCTs. Statin use and risk of kidney cancer: Only one meta-analysis published to estimate the effect of statin use on kidney cancer by including two RCTs and 10 observational studies published between 2001 and 2012. This study found no association between statin use and risk of kidney cancer with heterogeneity among studies. On subgroup and secondary analysis the association remains same among RCTs, cohort and case control studies and also for long-term statin use. Statin use and risk of liver cancer: Four meta-analyses[29-31,52] published in 2013 and 2014 regarding statin use and risk of liver cancer. All studies included observational studies but different in number and only two studies[30,31] included RCTs. All studies found significant heterogeneity among the studies included and shown 37%-42% decreased risk of liver cancer among statin users. This chemoprotective association is more pronounced in the Asian population, where viral hepatitis is the most important risk factor for liver cancer. On subgroup analysis by study design, the risk remains similar (37%-49% decreased risk) among observational studies but not for RCTs. Statin use and risk of lung cancer: Three meta-analyses[32-34] published in 2013 including almost similar number of RCTs and observational studies to identify the association between statin use and risk of lung cancer. All the three found significant heterogeneity among studies and no association between statin use and risk of lung cancer. On subgroup and secondary analysis the association remains same among RCTs, cohort and case control studies and also for long-term statin use. Statin use and risk of oesophageal cancer: Four meta-analyses (3 full-text[35-37] and 1 conference abstract) published in 2012 and 2013 on the association. Only observational studies contributed to the analysis in all studies except the Singh et al study also included one RCT (post hoc analysis). Results were consistent among all studies with 14%-28% decreased risk of esophageal cancer among statin users. On subgroup analysis, only case-control studies found with 44% decreased risk of esophageal cancer but not cohort studies and RCT. By using available studies, all the meta-analyses conducted secondary analysis on the risk of Barrett’s esophagus among statin users and found 41%-47% decreased risk. Two studies[37,51] also identified 55% decreased risk of esophageal cancer among long-term statin users. Statin use and risk of pancreatic cancer: A meta-analysis published by Bonovas et al in 2008 to estimate the co-relation between statin use and risk of pancreatic cancer by including three RCTs and nine observational studies. There was no relationship between statin use and risk of pancreatic cancer with heterogeneity among studies. The association found to be same even after subgroup analysis of study design. In 2012, Cui et al updated this meta-analysis by including four more observational studies published after previous meta-analysis. This study also gives an almost similar conclusion. Additionally, this updated meta-analysis reported no association between long-term statin use and risk of pancreatic cancer. Statin use and risk of prostate cancer: A meta-analysis published by Bonovas et al in 2008 to estimate the association between statin use and risk of prostate cancer by including six RCTs and 13 observational studies. No association identified between statin use and risk of prostate cancer. The association remains same even after subgroup analysis of study design and also for long-term statin use. In 2012, Bansal et al updated this meta-analysis by including 14 more observational studies published after Bonovas et al meta-analysis and gave contrast results by finding small (7%) but significant decreased risk of prostate cancer among statin users. But in a subgroup analysis of study design, no association observed between cohort and case-control studies alone. Both the studies also tried to identify the risk of advanced prostate cancer among statin users and found 23%-30% decreased risk. On the other hand, a study conducted by Zhang et al in 2013 by including only seven studies published after Bonovas et al meta-analysis and found a 19% increased risk of prostate cancer among statin users. Statin use and risk of skin cancer (melanoma): Four meta-analyses[43-46] conducted on this association, including one Cochrane systematic review published in 2005. All studies included only RCTs except the study by Li et al also included 11 observational studies. All the studies found no association between statin use and risk of melanoma and also the association found to be same for non-melanoma skin cancer by Li et al study. Interestingly, one RCT[43,44] suggested that the lovastatin can decrease the risk of melanoma by 48%. Meta-analytic evidence of association between statin use and risk of site specific cancers was piling since last decade. This overview of 38 meta-analyses covered 13 site specific cancers revealed that the statin use may reduce the risk of certain types of cancers like colorectal (8%-12%), gastric (27%-44%), hematological (19%), liver (37%-42%), esophageal (14%-28%), ovarian (21%) and prostate (7%). On the other hand, some evidence also suggests that there is no association between statin use and risk of bladder, breast, endometrial, kidney, lung, pancreatic and skin cancers. On secondary analysis, few meta-analyses suggested that statin use can also reduce the risk of rectal cancer (19%), advanced prostate cancer (23%-30%), Barret’s esophagus (47%) and also reduce the risk of recurrence of breast cancer (47%). In this review, we tried to identify the change in the risk of cancer among different types, doses and duration of statin use with the available information. Some of the meta-analyses categorized statins according to whether they were lipophilic (simvastatin, lovastatin, fluvastatin, and atorvastin) or hydrophilic (pravastatin and rosuvastatin) and conducted subgroup analysis. The studies didn’t find any statistically significant association between lipophilic or hydrophilic statins and risk of colorectal cancer[18,20], haematological cancer, lung cancer, pancreatic cancer[38,39] and skin cancer. In contrast, one meta-analysis showed an association between lipophilic statin use and colorectal cancer risk (RR = 0.88, 95%CI: 0.85-0.93) and a null association between hydrophilic statin use and colorectal cancer risk (RR = 0.88, 95%CI: 0.76-1.02); and another meta-analysis found a significant decrease in liver cancer risk for both lipophilic statins (RR = 0.57, 95%CI: 0.50-0.65) and hydrophilic statins (RR = 0.59, 95%CI: 0.41-0.84). The same study also revealed that higher cumulative dose of statin use, defined as statin use over 180 cumulative defined daily doses or 0.5 years (cumulative duration), showed a trend towards more risk reduction of liver cancer (RR = 0.53, 95%CI: 0.36-0.79). Some of the studies also conducted secondary analysis to identify the association between long-term statin use (usually ≥ 5 years) and risk of cancer, and identified reduced risk of oesophageal cancer (55%)[37,51], ovarian cancer (52%), but not for bladder, breast, colorectal, endometrial, kidney, Lung, pancreatic and prostate cancers[40,41]. Recently published overview to identify the role of statin use in cancer prevention and modifying cancer-related outcomes also come out with similar conclusions. However, this study suffers with some limitations in methodology and not covered few cancer types. Moreover, a recent meta-analysis of long-term efficacy and safety of statin treatment confirmed that statin treatment did not increase the incidence of cancer and deaths from cancers. Despite the examinations on statins consequences for tumor cells have proceeded from the mid 1990s, the exact mechanism that could clarify the anticancer effect of statins still unclear. Different types, dose and route of administration of statins being used, type/stage of tumors and time of exposure to statins may impact the mechanisms that lead to cell-cycle arrest and induction of apoptosis. One review observed that statins may decrease the cholesterol levels, leads to further changes in cell flagging. According to recent laboratory studies, statins seems to have chemo-preventive affect against cancer at various sites. Evidence suggests that statins are selectively localized to the liver, and only < 5% dose reaches the systemic circulation. This low systemic availability uncertians chemo-protective nature of statin[15,16]. We have made efforts to minimize the risk of bias in every step of this overview. However, this overview has few limitations. 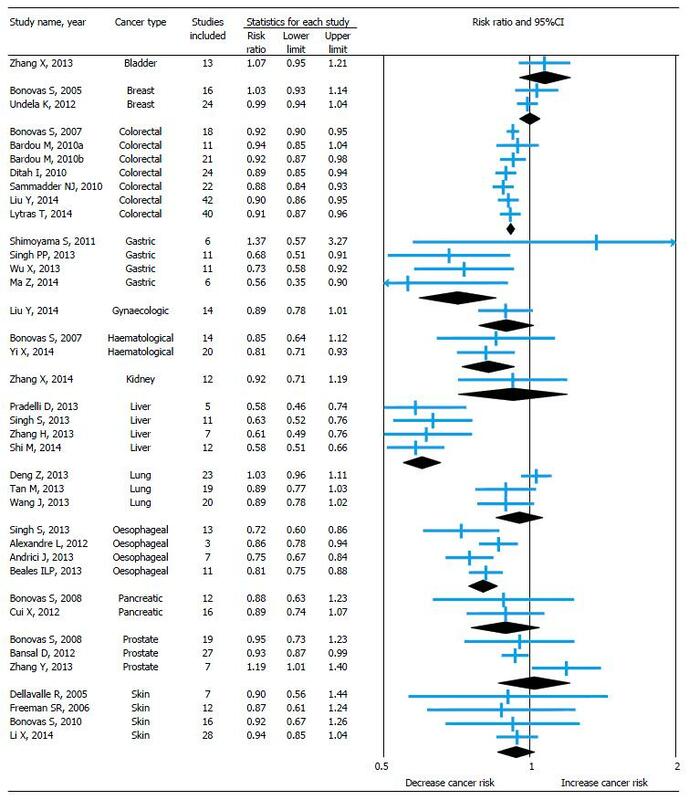 First, glitches in the nature of the primary data included in 38 meta-analyses; RCTs have not been adequately powered to detect potentially small differences in cancer risk due to the small number of cancer cases as it was not the primary outcome of these trials and the observational data may have suffered some common limitations of pharmacoepidemiological studies. Secondly, as most of the findings come from observational studies, there may be a chance of presenting “healthy-user bias” for part of the beneficial effects of statins. Statins are a promising group of drugs in cancer treatment because of their ability to reduce both cholesterol and isoprenoid levels. Meta-analyses of variable quality showed that the statins may have a potential role in cancer chemoprevention and reduce the risk of certain site specific cancers, but not all. Until a definitive benefit is demonstrated by randomized controlled trials, statins cannot be recommended either for cancer prevention or for modifying cancer-related outcomes. In recent years, emerging experimental evidence suggests that statins may have a potential role in cancer chemoprevention. However, a large number of randomized controlled trials and observational studies published to examine the association between statin use and risk of site specific cancers were given conflicting results. The objective of this overview is to summarize and critically appraise the evidence of relevant meta-analyses and present a comprehensive evaluation of the association between statin use and risk of site specific cancers. This overview of 38 meta-analyses covered 13 site specific cancers revealed that the statin use may reduce the risk of certain types of cancers like colorectal (8%-12%), gastric (27%-44%), hematological (19%), liver (37%-42%), esophageal (14%-28%), ovarian (21%) and prostate cancer (7%). On the other hand, some evidence also suggests that there is no association between statin use and risk of bladder, breast, endometrial, kidney, lung, pancreatic and skin cancers. On secondary analysis, few meta-analyses suggested that statin use can also reduce the risk of rectal cancer (19%), advanced prostate cancer (23%-30%), Barret’s esophagus (47%) and also reduce the risk of recurrence of breast cancer (47%). These authors made a comprehensive review of meta-analyses on statin use and risk of cancer. They also made tables and figures, which make readers easy to catch the study methods, strength and results from each meta-analysis. It will be informative for readers interested in this topic.